Zig Zag II top by Dorothy LeBoeuf, from Hawaiian shirts, batiks, linens, silks, solids. Spool by LeeAnn Decker, 72" x 72", 100% thrift store fabric. 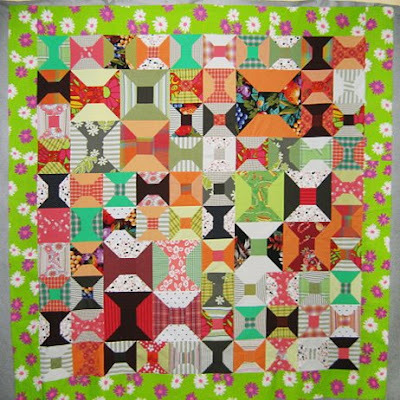 Housetop by Deb Rowden, 55 1/2" x 55 1/2" Recycled shirts and purchased plaids & stripes. My friend Deb Rowden and I are obsessed with Thrift Shop Quilts. And we have a few pen pals including LeeAnn Decker and Dorothy LeBeouf. We define Thrift Shop Quilts pretty loosely. 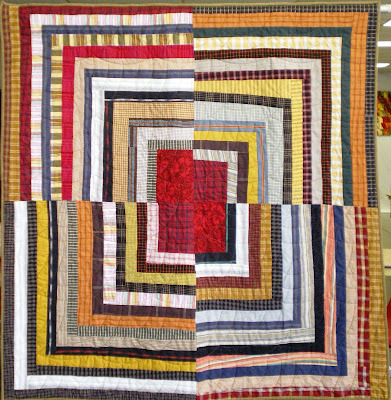 A Thrift Shop Quilt can be bought in a thrift shop. You can make one yourself out of fabrics you buy in a thrift shop, as LeeAnn often does. You can interpret a thrift shop design. Or you can just be inspired by the whole recycling idea---There are no pieces of fabric too small to save. Note Deb's quilt. Her motto: "It's not trash it's found." 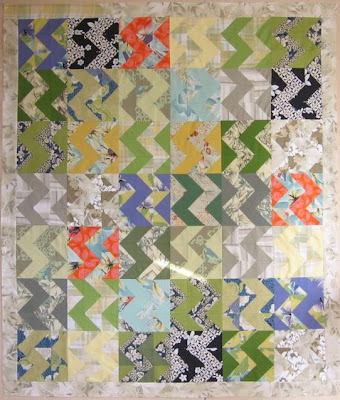 If you make Thrift Shop Quilts or collect them, send us some photos (My email is bbrackman@sunflower.com). We'll post them. Beautiful quilts. I have not used fabric from thrifts, but a friend sends me lots of her older fabrics. I do use a lot of thrift wool though and I am making on now, all out of wool. I agree, fabulous! Also enjoyed my visit to Deb's blog. Not exactly thrift shop quilts, but I love to work with the unwanted fabrics members donate to my guild's monthly Chinese auction. Sometimes the fabrics are less-than-lovely, but I look on those as a challenge. Occasionally the fabrics are drop-dead gorgeous; I just made a top destined to be a Quilt of Valor from Mary Koval fabrics I can't believe someone wanted to part with.